We mentioned “shared profit” such a number of times that it’s starting to hurt your eyes, yet the numbers are a bit elusive, aren’t they? 20% here, 40% there, 50% elsewhere, but what about some real projections? To be honest, it is a bit hard to predict it. But let’s try anyway. First of all you should read how it works? here. Many ICO’s rely on the hype about their activity to create higher demand, which usually causes the price to climb. And then, when you decide it’s the right time, you just dump the tokens. It may be a week, or few months, or even year from the start, but that’s about it. Others, like Giga Watt, issue tokens with very specific price – like 1 WTT is 1 watt, and it started from 1 USD. Considering how they are used, it means that the tokens already have a set price, and the aftermarket (or in this case – the after-sales) can boost it additionally. Putting the data and transactions on blockchain smart contracts will also increase the speed of service and save companies hundreds of thousands in reduced paperwork. Blockchain smart contracts are ideal for recording and facilitating the exchange of value, goods, services, and private data. Our token takes advantage of the digital and verifiable nature of blockchain to solve the fragmentation of the market and the marginalization of businesses and consumers. What does that say if you remove the blockchain gibberish? “We will take your money”? We never quite got the idea of launching ICO’s just to collect money for something that clearly won’t pay the people that crowdfund you through a sale or actually do anything for them except for listing the token sale through paid services. There are plenty of ICOs that are just about that – producing tokens and then trading them. It also skews the market, as such campaigns often promise great bounties, distributing even more of their tokens for free. Of consider this – if there are are 250 million tokens for bounties and someone tells you they are 2% of the max supply and they cost 1.4 million USD, would you believe them? Anything with 12.5 billon supply would sell for a single satoshi. We didn’t buy (well, some of us may have done it a few times) such assets, and we probably missed making some money by not doing it, but we felt it is just another aspect of the balloon-type economy we didn’t want to participate to. Why is Cryptum so much different? 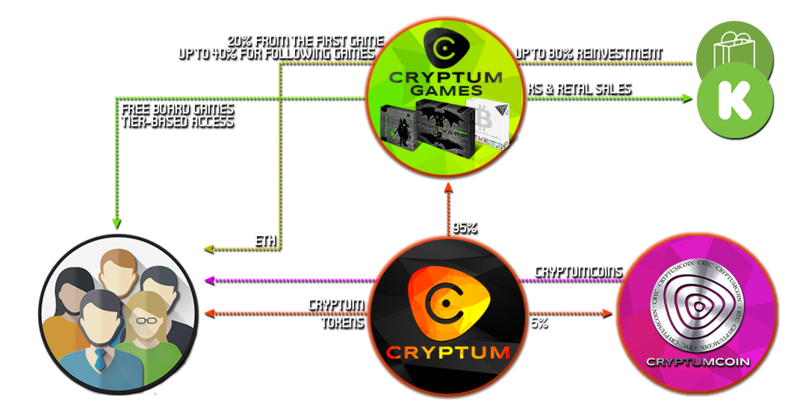 Cryptum tokens are serving both as a subscription for our games, and stakes for our shared profit pool. They also give you access to initial amount of Cryptumcoins – a new cryptocurrency we are launching in December 2017. If you are interested in our games, you should check the tiers guide. Developing board games is a dream-job for those people in the team that would do it under Cryptum logo. We’ve been working on games for some time, we have the contacts, we know a good game and piece of art from bad, and we follow the industry closely, in fact – we are part of this industry. The market is great – nearing 1.5 billion market cap while not even counting the crowdfunding, and that covers just a few percent of the potential, since games are not just fashionable, they are already part of the modern culture in the Western world and are becoming the same in the rest of the world, which is huge (and not mostly empty as you well know). Crowdfunding became a thing even for large corporations (even when they insist they are just a few people), so the potential for expansion is still at astronomical levels. if you make the game so good that people wouldn’t be able to resist it. There is a huge publisher called Cool Mini or Not that is often rumored to be paying their last campaign with the new one. Truth or not, they often raise over 1-2 millions with a single board game. How? Well, they are de facto industry standard for quality not many others can compare to. Best one-piece miniatures, amazing graphics, best designers, and so on. Funny, but they are importing stock in Europe at declared prices under the manufacturing cost in order to reduce customs charges and they have unnecessary high shipping charges for most of the world, but…you may learn something from that too. Now check Gloomhaven here. A game from unknown designer developed with lots of love. The first campaign was very small and people were shy to participate, but it ended with 4900+ backers, $386 000 raised… and 25 000 pre-orders in the retail chain with a wholesale price higher than the KS price (respectively the end-user priceanother 35% higher) – somewhere in the $100-110, range, so we are talking about $2.5 million in preorders. Isaac managed to serve only 2000 of the retail pre-orders and the whole Europe got like 60 games total. We were starved, because he couldn’t afford to print more games. The second campaign had 40 642 backers that pledged just shy of $4 million. And still – there are the same, if not even higher amount of retail pre-orders as before, this time at even higher price (+nearly 50%). $4 million weren’t enough to print as many games as the creator would ever need, so there were special pre-orders in the distribution channel, which are the only way to guarantee a store would get enough games to serve its customers. Our Primewarp: Genesis is a game that is close to the size of Gloomhaven. Godforge is even bigger. So here is why we cannot (or would not) just throw it in Kickstarter and get most of it. We would have to do it again, and then we will probably not be able to fund completely the Godforge game we first talked here because it would cost and worth even more (which is why it is on ground zero in terms of art now)… it would take us years of efforts. Sure, we will keep the profit, but… when? We will give you free games with free shipping almost wherever you are (no, we don’t ship to the South pole research stations, warzones, countries w/o reliable post network, etc., there is a thing called “common sense”) if you have just enough tokens to qualify. See tiers? here. We will pay to token owners between 20 and 40% of the profits from the Kickstarter, Indiegogo, etc. campaigns and following sales of every game we make. The rest of the profit will fund other games and their marketing. We will share 40% of retail and wholesale profits. Of course – you also get initial amounts of Cryptumcoins. Considering our first 4 base games and few expansions are already being developed and by buying Cryptum tokens you are paying for them, the profit is practically the difference between the manufacturing cost and the funds we receive, minus taxes and so on. Oh, again percentages. We expect Blockchain to raise between $250 000 and $350 000 just in Kickstarter. The game is great, but it’s a niche worker placement game. So, depending on the manufacturing cost, we would share between $25 000 and $45 000 with our token owners. These are not exact numbers, it is what we can predict based on what we know. The more, the better, of course. Then there are the 4 expansions, we couldn’t run number projections on them, but they will lead to more sales of the base game and their total price is just a bit over the base game price, plus this time with higher share for the token owners, we expect them to raise a fair amount, and for all of them shared profit will be between $50 000 to $80 000. Primewarp: Genesis is way more expensive so it will probably raise between $450 000 and $700 000, but it is also considerably more expensive to manufacture. Yet, the shared percentage will be higher, so you can expect anywhere between $80 000 and $130 000 shared profit. And it can turn to a gold mine if we manage to push to a million and more. Godforge: The First War is clearly a million+ KS and we are not sure we will be able to sell it in retail after the campaign. With high funding you can expect $140 000 to $240 000 to be shared, but the project might turn to be far more profitable or bigger than we can estimate now, because it is vast, and there was never anything like it. A World Without Borders is a project a bit over the level of the Blockchain game, with a bit higher cost but larger shares for you – let’s say double the shared profit of Blockchain. So far our modest projection is between $395 000 to $595 000 shared profits on top of the free games you get, and you still have your tokens in your wallet. Plus – there will be many people that would not claim their profits, and we will be redistributing these funds during the next round. These are KS-only projections, retail profits are substantially lower and based mostly on quantity, but we will launch a website serving Europe, so we will cover part of the retail sales at full price. Of course there are other games we will release (covered with Tier 4 and above only when it comes for free access), and we can decide to push some add-ons to a previous game depending on the popularity and the hype, etc. All these will work based on a similar formula. We haven’t decided yet all the specifics about the Cryptumcoins, so we can hardly give you any estimate. 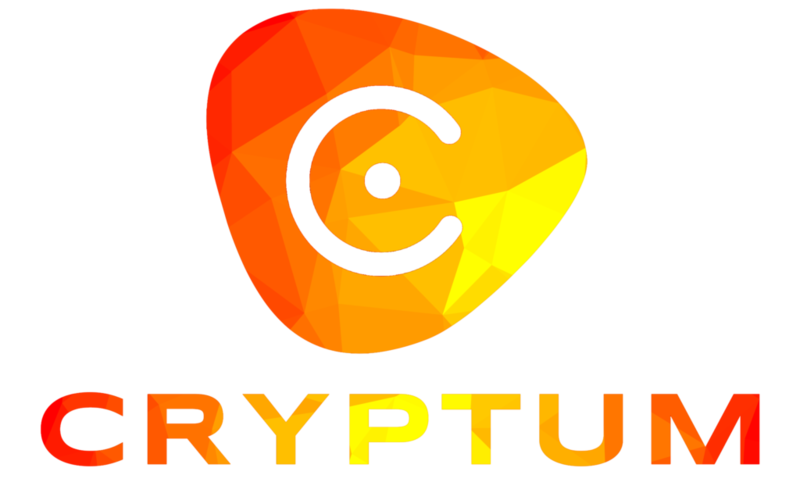 The best way to describe how much you will get is to imagine that we will distribute an amount with 1:1 ratio to the base number of all Cryptum Tokens with a total of available coins that can possibly be mined reaching 100 to 150 times that amount (or, if we change the numbers with 10:1, then the total would reach 1000 to 1500). The reason for these estimations is that we want to keep the premine as low as possible (although considering this will be happening at the time Cryptum tokens is readily traded on exchanges, it would be available to everyone), yet promote a price that is as close as the base price of Cryptum through a number of integrated features as block halving, PoS transition, low coin maturity, and fair algorithm that doesn’t blow GPUs, and we would accept coins back as payment method for some of our services or products when the currency reaches certain maturity and stable price (well, enabling this would further boost it, won’t it?). All in all, this is pure speculation as the Cryptumcoin specifications are not yet set, so consider them a nice bonus over your tokens. If you get a coin for each of your tokens that’s worth 1/10 of the price of a Cryptum Token, that’s already 1/10 of your initial investment returned. If the coins costs more – more power to you. And we wouldn’t even bother if we were creating a cryptocurrency with a cost that is considerably lower than that.